Da Capo Press, 9780306825361, 528pp. 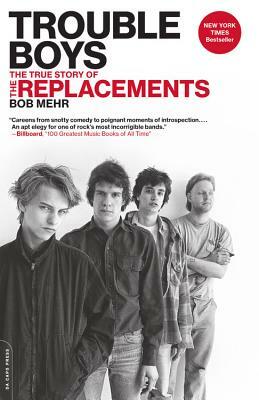 Based on a decade of research and reporting--as well as access to the Replacements' key principals, Paul Westerberg and Tommy Stinson--author Bob Mehr has fashioned something far more compelling than a conventional band bio. Trouble Boys is a deeply intimate portrait, revealing the primal factors and forces that shaped one of the most brilliant and notoriously self-destructive rock 'n' roll bands of all time. Beginning with riveting revelations about the Replacements' troubled early years, Trouble Boys follows the group as they rise within the early '80s American underground. It uncovers the darker truths behind the band's legendary drinking, showing how their addictions first came to define them, and then nearly destroyed them. New York Times bestselling author Bob Mehr is a music critic for the USA Today Network newspaper The Commercial Appeal and a longtime contributor to MOJO magazine. He lives in Memphis, Tennessee, with his wife.